Eero Pro (2nd Gen.) Vs Netgear Orbi - Which WiFi Mesh is Better in 2019? In this article we will compare and contrast two of the best (in our opinion) WiFi mesh systems on the market, namely EERO 2nd generation and Netgear Orbi. The Internet and Data communication needs of the modern home and office workspace nowadays demand much better wireless network coverage and speeds. Smart Home Automation, Video Streaming services, online multi-player gaming, Ultra High Definition multimedia, SmartPhones everywhere etc, all contribute to these higher demands. The previous generation of WiFi, which consisted of only a single WiFi router in one corner of the house, has still its place in the market. However, we are witnessing now a new era in WiFi network infrastructure. This is the mesh-WiFi era whereby wireless networks consist of a central router and one or more additional “satellite” or “beacon” wifi units which create a “mesh” or “umbrella” network in the house or office without compromising speed. Each WiFi-enabled client device (smartphone, laptop, smart TV etc), now connects to the “mesh” network and not to a single router in some corner of the house. The two products that we will be discussing in this article belong to this new WiFi Mesh technology and are two great options with lots of features as you will see below. The NetGear Orbi is considered as one of the top performers in terms of coverage and speed in Tri-band Wi-Fi mesh systems. The main difference between an Orbi and a standard wireless network is that the entire Orbi system acts as a single blanket wireless network with a single SSID. This means that all connected home devices and gadgets (smartphones, tablets, laptops etc) can roam freely inside the house or office without having to change connections or dropping from one wireless network to another. Like most mesh wireless networks, it comes with a base router station and one or more extension “Satellite” units with a support of up to three satellites total. This means that you’ll get the full speed and functionality of your router no matter where you are or whichever Satellite you’re connected to. The NetGear Orbi assigns a 5 GHz frequency band that is dedicated to just communication between the base station and the satellites (at around 1700 Mbps bandwidth). Moreover, if you want you can connect a satellite unit with the main router unit using a physical Ethernet cable for even better connectivity. That means you won’t lose any bandwidth allocated to your home devices. It also means that the Tri-band Orbi product functions more like a dual-band router with a single 2.4 GHz and a single 5GHz channel available to the end-devices and a dedicated 5Ghz band for backhaul (link between Orbi units). Because of its support of Multi-User Multiple-Input/Multiple Output (MU-MIMO) technology and also working under the newest 802.11ac wireless standard, you get the full benefits of MU-MIMO and Beamforming on all the satellites as well. These are features that a range extender could only dream of. The Orbi Wi-Fi system comes as a kit but also individual devices can be purchased separately as needed (for example extra satellites to extend the network). It includes an Orbi Wi-Fi main router and one or more satellites that deliver great Wi-Fi coverage. It covers home areas of 5,000 square feet and more with the best Wi-Fi signals you can imagine. Furthermore, the tri-band system helps maximize the wireless speeds when transferring large files inside the home, streaming a high definition movie or playing multi-player games. All ISP modems and routers are supported (Verizon, Xfinity, Comcast, DSL, ATT etc). Most Orbi models do not include an embedded ISP modem so you will need an external modem device from your Internet provider. The only exception is the CBK40 model which includes an embedded Cable Modem. This means that you can return the cable modem rented to you from the ISP and thus save money. Netgear Orbi is probably the most flexible from all mesh wireless products in terms of connectivity (i.e between Orbi units and also between user devices and Orbi). Both WiFi and Ethernet wired connection options are available on all Orbi units (Router Unit and Satellites). 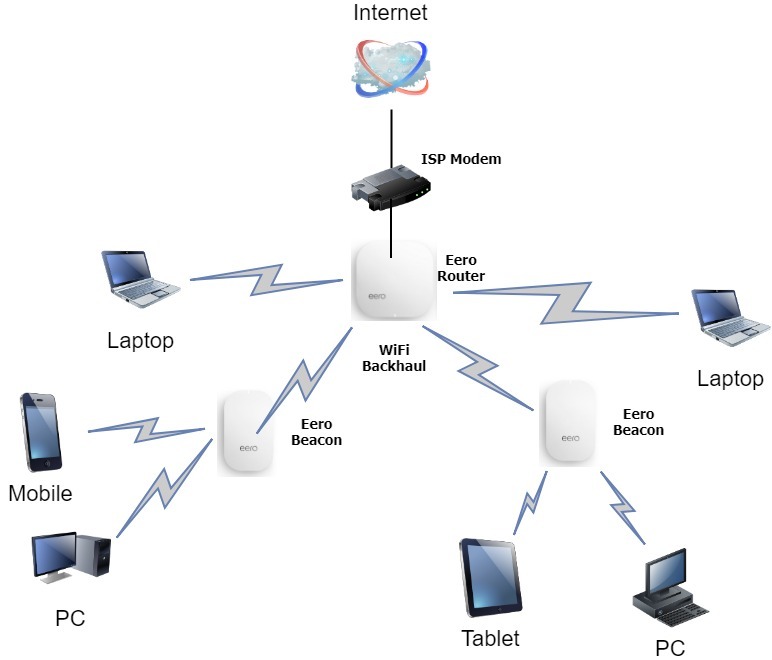 The main Orbi Router device has 1 WAN port (for connecting to the ISP Modem) and 3 LAN ports (for connecting to Orbi Satellites as Ethernet Backhaul and also for connecting to client devices). The Satellites are also equipped with 4 LAN Ethernet ports for connecting devices that don’t have wireless capabilities (e.g printer, desktop PC etc). Connectivity options of Orbi are much better compared to Eero since the latter does not have any Ethernet ports on its “Beacon” devices unlike “Satellites” in Orbi system. The Orbi satellites are simply plug and play. To set up the home Wi-Fi network, all you need to do is connect the base router station to your ISP modem and run a step-by-step wizard on your connected computer or smartphone, and you’re good to go. You don’t have to manually assign IP addresses or rename network SSIDs and to add a satellite, all you need to do is plug and power. The two-unit system should be able to cover a range of 5,000 square feet (depending on the model purchased). The Orbi system is built to be modular. While one satellite is included in the standard box, you can add up to two more and each one gives you 2,000 more square feet (on average) of coverage. Meaning, if you add one more, it’ll be 7,000 square feet and two more makes it around 9,000-10,000 square feet. The system will give you the authority to create separate guest accounts and allow your guests to use the Wi-Fi. Also, its integration with Alexa will allow unthinkable functionality. The Orbi maintains great throughput speed in almost any types of houses (single-floor, double-floors, thick walls etc). Since both the Orbi main router unit and also the Orbi Satellite units are equipped with several physical Ethernet ports (in addition of course to the WiFi connectivity), you have multiple options to connect the units between them and also to connect home devices to the network. The Backhaul is the link connecting Satellite units to the main Router unit. It plays a significant role in the speed performance of the whole mesh network. The Netgear Orbi has a dedicated WiFi backhaul link (1.7Gbps at 5Ghz band) and also you can connect Satellites to the router unit using wired Ethernet. Moreover, with a recent firmware update, you can also daisy-chain Satellites between them (i.e connect one Satellite to another). The shape and size of the NetGear Orbi is unattractive. While some may find them stylish, the tall and thin body is easy to knock over. The Orbi is quite expensive. Ranging in price from $200 to over $400 (depending on the models) is not quite affordable to many. Now that most of the devices we use rely mostly on internet connection, from TV to smartphone, a strong Wi-Fi network is always important to have. Eero is the first startup company (crowd-funded) that introduced mesh Wi-Fi systems to the world. Unlike a traditional WiFi router, Eero is a network that blankets every inch of your home/office in wireless coverage. It does this by combining the concepts of a router, a range extender and a repeater into one single device. In this article we are examining the 2nd generation of Eero which is an upgraded version working in Tri-band frequencies instead of Dual-band of the previous version. Similar to the Orbi product, Eero comes with a central Router Unit and additional Beacon units (similar to “Satellites” in Orbi). As we’ve mentioned before, EERO is a startup company which in 2014 assembled a strong team of engineers and designers to launch the EERO wifi system. Former Apple exec and Palm CEO Jon Rubinstein. Fred Bould. He is part of the design team behind the Nest thermostat and smoke detector, the brains behind the GoPro Hero3 and the latest Roku boxes. Apparently, he is not just one of the advisors, but also the founder and creative mind behind the Eero’s industrial design. Employees who are all former employees of Google and Silver Spring Networks Company with great networking and engineering skills. These great minds have made Eero what it is now. It has great specs and overall outlook. From the hardware to the software, Eero was built to bring a minimalistic and futuristic design. First and foremost, Eero is a successful Wi-Fi system enterprise because of the superb features it has and also its appealing design which has much smaller footprint compared to Netgear Orbi. A small footprint with dimensions of (4.75 x 4.75 x 0.85 to 1.26 inches). A main router component and extra beacons depending on the number and size of rooms. Dual Wi-Fi radios for simultaneous 2.4GHz and 5GHz connections and support for 802.11a/b/g/n/ac. Ofcourse you can buy single units (routers or beacons) to extend the whole network. The wireless area covered by the product depends on which bundle kit you will purchase (see previous paragraph). The smaller kit (1 eero router + 1 beacon) covers a small home up to 2000 sq.ft. The most popular option is the kit with 1 eero router + 2 beacons which covers medium-size houses of up to 3000 sq.ft. By adding extra Beacons you gain additional 1500 sq.ft per beacon. As you can conclude here, EERO has much lower WiFi coverage compared to Netgear Orbi. Just like the Orbi system, EERO supports all ISP modems and routers (Verizon, Xfinity, Comcast, DSL modem, ATT etc). If the ISP modem allows you to connect to it with a normal Ethernet cable (cat5, cat6) then EERO supports it. In our opinion, this is a weakness of EERO compared to Orbi. The main router unit has only 1 WAN ethernet port (for connecting to ISP modem) and 1 LAN Ethernet port (for connecting to an additional EERO router if needed). However, the Beacons do not have any Ethernet ports. This means that the only Backhaul option for Beacons (i.e the way to connect with the main router) is via WiFi Backhaul only. Also, you can’t connect any home devices with Ethernet cable to the Beacons (they must support WiFi in order to communicate with the mesh network). Eero has incorporated the easiest setup you could ever imagine. It’s just a plug and play process requiring no high-tech to install. All you have to do is plug in the beacons, install the app on your phone and follow the prompts. The app will even guide you where to place the beacons in the house for better coverage. One beacon can do the job just fine if you have a small space and don’t mind about the range. Multiple Eero beacons offer maximum access and best connection to the Wi-Fi network. The main router unit is simply connected to the ISP modem to become the master device. Afterwards, a launch of the eero app on the Android or iOS smartphone is done to connect it via Bluetooth 4.0. At this point, you key in your username and password for identification and security reasons. Take the other Eero beacons and plug them into any power outlets at different areas of the house. The system is quite convenient with its automatic cloud base that updates itself automatically. In case of any bugs or potential security risks, the updater gives you guarantee that you will be just fine. Another great feature is the compatibility of the system. If you have guests over, all you got to do is use the Eero app to send them a text with all the network information on it. In case they have the Eero app in their devices, you can add them to the network without having to key in passwords. The system will be notified of the added devices and will run a performance booster to ensure that the speeds are not brought down by the heaped connections. Maybe the fact that some of the company executives were former Apple executives, they played a significand role in influencing the design of the product. Its certainly much smaller than Orbit and looks more stylish as well. This product is famous as one of the easiest to install and setup. With the Eero app in your hand, you will be able to tell what’s happening on your network, check device usage, share your network with friends, or even pause the internet. With the app, you can allow guest access through the app and still maintain passwords to yourself. If you have kids, you can set their Wi-Fi devices to only connect at specific times. The Eero is quite simple, quick and easy to set up. Once you got the Home WiFi System up and running, Eero will sort all the troubleshooting and updates. This gives you the peace of mind of continued productivity without hesitation. Unlike common routers, Eero gives the pleasure of automatic security updates. You don’t have to search for updates, download them, or install at all. Also, you don’t have to reset the router when it’s having trouble connecting to the internet. The Eero app has received a ton of great reviews but customers seemed to be bothered by frequent disconnections. Disconnections especially between computers connected to the network, other home automation devices such as Amazon Alexa, and UPnP devices like game consoles). This might be because of weaker coverage and weaker wifi strength of the Beacon units. With prices ranging from $125 to more than $400 (depending on the product kit), consumers find it a bit too expensive compared to other products. Of course, compared to Netgear Orbi, prices are comparable. Another disadvantage the Eero Wi-Fi system has compared to Orbi is that Beacons do not have any Ethernet ports. This limits connectivity options of home devices to the mesh network. At first glance, there’s not much difference because of the simple operation of the systems. Usually users do not have problems installing and operating the devices. Both Netgear Orbi and Eero hardware are built using the Qualcomm chipsets. They both use the Atheros IPQ4019 chipset. Additionally, the Netgear Orbi is also equipped with 512 MB of DDR3 RAM and 4GB of flash memory (Samsung KLM4G1FEPD-B0310), while the 2.4GHz radio along with the first 5GHz radio band uses the Qualcomm IPQ4019 chipset and the dedicated 5GHz radio (dedicated for backhaul) uses the Qualcomm QCA9984 chipset. The Eero unit comes equipped with 512 MB of RAM (Nanya NT5CC256M16DP-DI) and 4 GB of flash memory (from Kingston), while the 2.4GHz radio along with the first 5GHz radio uses the Qualcomm IPQ4019 chip and the second 5Ghz radio takes advantage of the Qualcomm QCA9886 SoC. The Orbi and Eero support Bluetooth LE technology, using Bluetooth 4.1 and Bluetooth 4.2. Moreover, at the core of WiFi communication both systems work with the IEEE 802.11ac standard which is the newest generation of wifi standard. This means that Beamforming is also supported by both products. This feature allows the systems to send wifi signals directed to specific user devices (instead of broadcasting the signal to the whole space) thus achieving better and more efficient wireless coverage and throughput. When it comes to performance, the NetGear Tri-band can deliver theoretical max bandwidth of 3000Mbps (on the AC3000 models). This is the combined speed of all frequency bands (see this article for explanation of AC specs in WiFi systems). Manual testing of the Orbi router from a third-party lab test turns in a score of 480Mbps, and the satellite delivers 470Mbps. At a distance of 30 feet, the Orbi router records 223Mbps, and the satellite scores 220Mbps (these numbers are from a specific independent lab test). To maximize routers performance Orbi uses a separate 5GHz band that’s used only for communications between the router and the satellite. In comparison, other legacy Wi-Fi extenders use the same bands to extend signal, which results in a 50% signal loss each time the signal is wirelessly extended. Its important to note that Orbi performs very well in most independent performance tests which you can find easily online. Compared to that, Eero theoretical speeds are less than Orbi. Not only in theory but also in practice, several third-party lab tests which measure wireless speed performance categorize Eero as having lower performance in general compared to Orbi. The Eero comes with a very user-friendly companion mobile app that lets you setup the system, monitor the speed and give access to visitors. The Orbi has a very rudimentary app because you have to use the website’s interface to make changes in your settings. Eero is much smaller and stylish than Orbi. The latter is bulky and tall. As mentioned many times in this article, Orbi shines in terms of connectivity options, offering plenty of physical Ethernet ports on both router and satellites. Eero is almost entirely based on wireless connectivity. Both Eero and Orbi are great mesh Wi-Fi systems. They have great qualities and features to bring the best internet and wireless connection in your home. They are in the upper price bracket of mesh Wi-Fi systems but it depends on the area you want to cover. Bigger areas such as huge homes will require more satellites and beacons, but ultimately, the best mesh system for the strongest connectivity and performance, would be the NetGear Orbi. If you are going for a more stylish design and not concerned a lot about performance and coverage, then the Eero product would be the best choice. Setting up a single wireless router for your home or office is not a hard task. All you got to do is connect your ISP modem to the router with an Ethernet cable, plug in power and go through a simple wizard on your computer or smartphone (usually you just need to enter the WiFi password to connect to the router). If you are living or working in a huge space, one traditional WiFi router may just not be enough in terms of coverage and communication speed. In order to counter this, most people add an additional access point, a wireless repeater or range booster but they are usually slower and hard to configure. Here is where the mesh Wi-Fi becomes relevant. Mesh networks are all around us. If you have connected to Wi-Fi networks in school, at a convention centre, school campus or mall, then chances are that you have used it before. 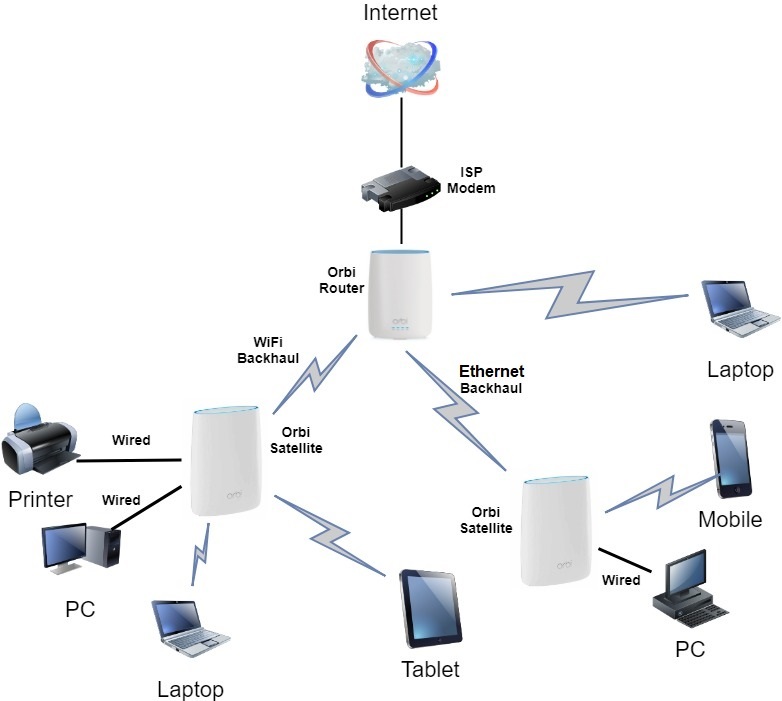 An ordinary wireless network like the ones found at homesteads, are arranged in a hub and spoke model. Your modem connects to your router and every other device connects directly to the router. It’s the most simplistic way of connecting all the devices using Wi-Fi, together. The problem becomes significant especially when the router is single-band and all devices share the same frequency band. This creates latency when many devices are connected. If you are in a large house or small office building and the Wi-Fi signal from your router isn’t strong enough, then that’s where the headaches begin. Devices like wireless repeaters and range boosters might sound great on paper, but more often than not, they cause more problems than they actually solve. And not being biased about these devices but usually these devices create an additional network SSID on top of the original network. This means, if you’re roaming outside your router’s range and into your repeater’s range, then probably your devices won’t be smart enough to automatically switch to the new stronger network. It will probably linger on one network and not do anything unless you manually disconnect and reconnect. Another reason is that most repeaters operate on a single channel. A repeater uses the same wireless network to receive signal from your router, process it then repeat it to your devices. This cuts the overall bandwidth in half.